"Pinching pennies" is my life long slogan. I am always on the trail of the next- high style look, minus the high-end cost. I would change the decor of our guest bedrooms every year, if I thought it was practical. Believe me, it takes great restraint. I am constantly in need of new bedside tables or end tables & have been a fan of the basic cube since my middle school days. My father built me one for my bedroom & painted it a mod shocking 60's purple. It was one of those pieces that even left home with me in the 70's. 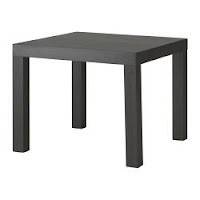 Here is my 2009 version - Purchase two Ikea Lack end tables @$12.99 ea. Put the first one together & leave the legs off of the second one, using merely the top. Using a construction type adhesive (available at your hardware stores), glue the top of the second table to the bottom of the table legs of your first table. Use the photo of the cubes from West Elm as a guide. 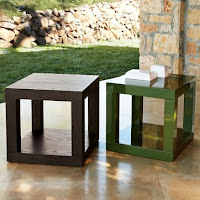 The stylish West Elm parsons cube end table, retails for $159. A terrific way to achieve a very similar look for under $25. Music to my ears. Ikeas Lack tables are available online as well as in store. They come in a variety of finishes & colors to make decission making a breeze, or not?